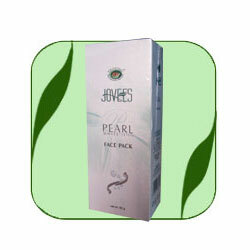 This special Pearl series product has been developed using nano technology. The nano skin care technology involves the inclusion of nano particles in the range of 100-140 microns within the products that can get deeper into the skin to produce beneficial results. This face pack is produced using scientific methods so that the therapeutic propeties of botanicals and herbs used do not mitigate thus ensuring optimum results. The active ingredients used in this precious pearl face pack are derived from natural sources, which works to give skin a fairer and smooth look.